Fueled by a Congressional showdown with Goldman Sachs executives, economic news led news coverage during a crowded week that also featured the uproar over Arizona’s new immigration law and the developing ecological disaster in the Gulf Coast. The economy garnered 24% of the newshole during the week of April 26-May 2, according to the Pew Research Center’s Project for Excellence in Journalism. That was down slightly from the week before (27%, a 13-month high for the topic), but still represented a strong showing for a story that has attracted more of the media’s attention in recent weeks. One reason for the revived media interest in economic news may be the emergence of an alleged villain in an otherwise complex narrative that had been dominated by statistics and competing policy claims. Executives of Wall Street investment firm Goldman Sachs, which federal regulators have accused of fraud, spent 11 hours defending themselves before a Senate committee investigating the financial meltdown. A political struggle over the fate of a financial reform bill also fed coverage of the economy. Last week, Republicans dropped a threatened filibuster and permitted the bill to move to the Senate floor, ending weeks of acrimony and making passage more likely. The potential catastrophe in the Gulf of Mexico emerged as the No. 2 story for the week, filling 16% of the newshole. The oil spill began as a human tragedy with the fatal April 20 fire that killed oil workers and sinking an offshore oil platform. Last week it morphed into an environmental saga as crude oil gushed from the seabed and neared the shore of Louisiana and Mississippi. As time passed, a political element crept into the coverage as well, as some raised questions about the federal government’s response and invoked comparisons to Hurricane Katrina. Also filling 16% of the newshole was the No. 3 story, immigration. The topic was overwhelmingly dominated by the debate over Arizona’s controversial efforts to stem illegal immigration from Mexico—a subject especially lively on cable and radio talk shows. The new state law consumed more than half the airtime on those largely ideological talk shows last week, according to a PEJ analysis. Next, at 6%, came coverage of the 2010 mid-term elections, a subject driven by Florida Gov. Charlie Crist’s decision to run as an independent in the state’s Senate race. Coverage of the health care debate, which has plunged dramatically since the Democrats passed a bill in late March, was No. 5, at 3% of the newshole. The appearance of Goldman Sachs executives before a Senate committee investigating the causes of the recession provided a rare interlude of bipartisanship in Washington. Republicans and Democrats took turns probing allegations that the company profited from doomed investments it sold to its clients. Like insurance giant AIG last year, which was attacked for paying huge bonuses while receiving a federal bailout, Goldman Sachs provided a focus for outrage over the perceived excesses of Wall Street. MSNBC’s live coverage of the hearings on Tuesday, April 27 carried the on-screen caption “Grilling Goldman.” Senators repeatedly read from internal emails obtained by investigators in which top executives bragged that they were profiting from the housing downturn, among other things. NBC Capitol Hill correspondent Kelly O’Donnell noted that senators read the emails, expletives and all. The news channels bleeped out portions. “We’ve seen a lot of lively discussion and questioning,” she O’Donnell told viewers. More than a third of the economic coverage last week, 37%, involved stories about Goldman Sachs. Another 25% was devoted to the bill to reform financial regulatory and oversight laws. The legislation got a boost from the Goldman Sachs hearing as well as a lawsuit filed by regulators against the company on April 16. Republicans initially blocked consideration of the reform bill, assembled by banking committee chairman Christopher Dodd of Connecticut, saying it needed revision. Democrats responded by charging Republicans with obstructionism. The partisan conflict played out for several days until Republicans relented on April 28 and the two parties agreed to begin debate on the bill. News coverage of the ill-fated drilling operation in the Gulf of Mexico pivoted from the initial focus on the 11 missing oil workers during the week of April 19-25 to the potential impact the spill will have on the ecology and economy of states in its path. The story accounted for 16% of the newshole from April 26-May 2 but gained momentum throughout the week. From April 29-May 2, it was the top subject, at 32% of the overall newshole. The spreading oil slick, and the failure of officials to either corral or cap the submerged gusher, attracted substantial interest from all news sectors. It was the No. 1 story on network television, which tends to focus considerable attention on disasters and devoted 24% of the airtime studied to the story during the week. It was the No. 2 story in newspapers (at 13%) and with online news outlets (16%). On cable TV (17%) and radio (13%), it was No. 3. By the weekend, a political component emerged in the narrative: the disaster was connected to energy policy. MSNBC’s Keith Olbermann called it the “Sarah Palin Spill,” reprising the former GOP vice presidential candidate’s “drill, baby, drill” exhortation on the campaign trail. But one of his guests on Friday, April 30, analyst Richard Wolfe, said the incident called into question President Obama’s policy of opening up previously closed coastal areas for oil exploration. “The idea that the industry was so technologically savvy, so environmentally conscious that their assurances that all this drilling was safe that pristine areas or protected areas could be opened up to drilling—that whole premise has been shot full of holes now,” Wolfe said. On his radio show, conservative host Sean Hannity said oil was important to the nation’s economy and warned that the accident should not be allowed to halt domestic exploration like the partial meltdown of the Three Mile Island nuclear power plant in 1979 hampered nuclear power development. Meanwhile, Hannity and other talk hosts devoted significant air time to a new law in Arizona that, among other things, permits police to demand proof of immigration status from people suspected of being in the country illegally. While it was the No. 3 story overall for the media last week, at 16% of the newshole, it was the top story on radio and cable TV talk shows and consumed more than half of the airtime (54%) studied. And unlike the political sector, where some conservatives raised objections to the new law, there was little ambiguity over the airwaves. On the Fox News Channel, host Tucker Carlson said the Arizona legislation was a legitimate response to a wave of illegal immigration in that state and that opponents had misconstrued the law for political gain. “I think we all know what this is really going on here…this is an attempt by the Democratic Party to whip Hispanics into a frenzy and get them out on their behalf in 2010,” Carlson said. With Florida Gov. Charlie Crist announcing he was dropping out of the Republican senatorial primary to run as an independent, coverage of the 2010 mid-term elections registered as the No. 4 story, filling 6% of the newshole. 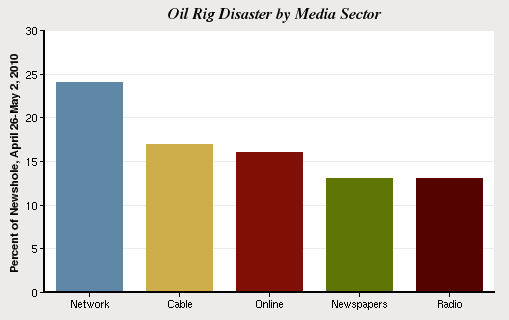 As is often the case with political news, it generated more coverage on cable (10%) than any other media sector. Rounding out the top five stories was health care, at 3% of the newshole. That is very much in keeping with the modest level of coverage since the political battle over legislation ended in late March. From April 1-May 2, health care has accounted for only 3% of the newshole, the same level as last week’s coverage. Several story lines accounted for interest in the topic from April 26-May 2, including thousands of uninsured people lining up for free medical care at a clinic in California. Charlie Crist’s decision to abandon the Florida Republican primary for an independent run made him the top newsmaker for the week, other than Barack Obama. The President was a lead newsmaker in 6% of last week’s stories, down slightly from 7% the previous week. 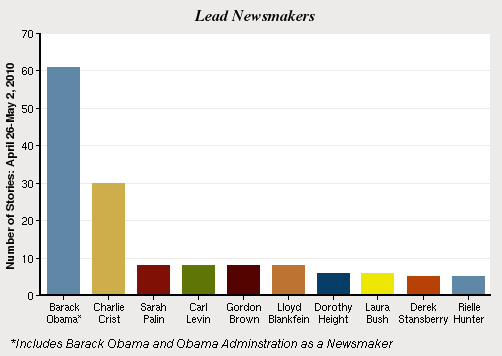 (To be a lead newsmaker a person must be referred to in at least 50% of the story). Crist, the Florida governor, was the lead newsmaker in 3% of the stories in the PEJ sample last week. The rest of the week’s top newsmakers registered in 1% of the stories. That included Sarah Palin, who defended her support of off-shore oil drilling and Goldman Sach’s chief executive Lloyd Blankfein, who testified before Congress. Also making the list was British Prime Minister Gordon Brown, whose faltering campaign suffered another setback after an open-mike gaffe and Michigan Sen. Carl Levin, who as chairman of the committee looking into the nation’s economic collapse, took the lead in grilling Goldman Sachs executives last week.